HAS BEEN SUSPENDED FOR THE CURRENT TIME DUE TO THE FLOODING. Please go to my SACRED WALKS FOR COLORADO page for information on how to participate in a sacred healing walk in October. Is this you, beautiful one? You long for deep connection with yourself, to know and align with your purpose, to express your creative gifts and talents, and contribute to making this world a better place. You know that you've got something inside of you that yearns for connection, for expression, for creation and contribution. However, like so many women, you may also feel that there is a disconnect and a gap between what you know deep inside yourself and the reality of your daily life. It may be that life is feeling a bit too hectic. Your everyday roles and responsibilities have you scrambling from one thing to the next with not much left for you. At the end of the day, you’re flopping into bed exhausted, wondering where the day went and where the juice is in your life. There’s a chronic inner rumbling of dissatisfaction that, on the surface, doesn’t make any sense, given that it appears your life has everything. You might even feel a little guilty to even admit the rumblings, yet despite all of the outer blessings, you don’t feel quite at home with yourself. You're finding that in doing more for everyone else, you’re doing less and less for yourself. And you’re starting to realize that’s not okay. Or maybe you're simply intrigued by the possibility of walking to walk...not for any purpose other than to walk and to be with yourself. Perhaps you're not sure how to step onto this powerful path. What if, this is simply a calling forth, an invitation to a sacred walk, a sacred pilgrimage? What if it's time to s-l-o-w down and give yourself a deeply soul-nourishing experience in which you name your own heart’s desire and then walk your way to it and in the company of other like-hearted women? If this is what you've been yearning for - a slower moving, walking, soul-nourishing experience that invites you to connect with your true self and your core desires, I've created an experience for women just like you. Just to you know, this was me, four years ago. I had a great life with an amazing family, supportive and loving husband, four kids, soccer schedules, work, meals, and yes, even leaky bathtubs! Yet something was stirring in me, and try as hard as I might, the nigglings just wouldn't go away. It was at this point, four years ago, that I discovered sacred pilgrimage, and I have been walking my way home ever since. I have now walked on sacred pilgrimage paths four times over the past four years. I have walked the Camino (now popular thanks to "The Way", the movie by Emilio Estevez and his father, Martin Sheen) to Santiago in 2009, and from Santiago "al contrario" (the other way) across the Pyrenees into St. Jean Pied de Port in France in 2010, from St. Jean to Auch, near Toulouse along the Chemin de Saint Jacques in 2012, and on the Saints' Way, St. Michael's Way, and the first section of the Mary Michael Pilgrims Way in Cornwall this past June. I walked on my own for the first time in Cornwall, and in doing so, tapped into a deep well of inner strength and courage. And, by the way, I still have a great life! Actually, an even better one - still with an amazing family, supportive and loving husband, four kids, soccer schedules, cooking meals, and leaky bathtubs!! Now, though, it includes me and my dreams, desires and purpose in an even deeper and more real way. Sometimes inconvenient, to be sure, but at least now I have reconnected to what they are, and have a map, tools, and connection to myself to fulfill and integrate them. These, and so many other gifts, are available through walking a sacred path to sacred sites, whether you walk alone or with others, whether your travel abroad or experience the sacredness right here in your own community. I'd love to share with you the opportunity to experience for yourself these gifts! What if it's time for you to walk your path...now? Yet, how do you say YES to a calling to walk a sacred pilgrimage when life and all of its responsibilities, relationships and commitments pull on you too? It can be a really big undertaking to leave your family, your job, your business for an extended time, sometimes even for a weekend! Also, it may not even be feasible to travel to far away places for weeks at a time. Plus, you may not even want to. What if there was a way to go on a sacred walk, to walk with other like-hearted women, to be part of a sacred experience, and to be guided and held as you journey home to yourself...and not even have to get on a plane, spend a lot of money - or time, or even carry a 20+ pound backpack...yet receive the same benefits and gifts from the journey as though you did?! This is exactly why I've created a LOCAL and WEEKLY, yet SACRED WALK, SACRED PILGRIMAGE right here in Boulder. I've scheduled for 3 hours on Saturday mornings, one of the more convenient times of the week for you to do something for yourself. I've also timed it to take advantage of the golden autumn days in Colorado, plus I've designed it to have as much meaning, depth and impact as a sacred pilgrimage on a sacred path in a far away place. "By its very nature, a pilgrimage is something that takes people out of their ordinary lives and cares -- removes the known scaffolding of their life -- and sends them on a walking meditation into the unknown with a singular purpose: deepening their connection to their spirit by arriving in many sacred places." to connect with and come home to your Self, your gifts and your purpose, and to walk your path. Labyrinths are usually in the form of a circle with a meandering but purposeful path, from the edge to the center and back out again, large enough to be walked into. Each has only one path, and once we make the choice to enter it, the path becomes a metaphor for our journey through life. The labyrinth is a spiritual tool meant to awaken us to the deep rhythm that unites us to ourselves and to the Light that calls from within. In surrendering to the winding path, the soul finds healing and wholeness." to receive the sacred wholeness within yourself. Simply, labyrinths offer us a respite from our busy lives with an invitation to pause, to enter a sacred space, and to walk with an awareness of being in a different space. While inside a labyrinth, we can ask a question, create an intention, receive an answer, or simply walk and be with the experience. We can surrender to the path and know that it will take us to the center - our center, and back out into the world again. 7 circuit Chartres-style Labyrinth at St. John's Church. While each labyrinth is in its essence both a circle and a spiral, each is different, unique and has an energy and expression all of its own. The labyrinths that we will walk to are varied and distinct from each other, in terms of location, materials used, design, size, circumference, and energy. Some are made with flagstone, white stones, rocks and shells. Others are made of grass, earth or sand. Some are in the shade; others are in the sun. Their paths vary in width, material, length. Some are engineered with precision. Others have an organic quality to them. Some are out in the open, right under our noses, such as at the Public Library along Boulder Creek or outside of St. John's Episcopal Church along Pine Street in downtown Boulder. 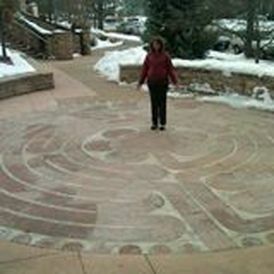 The Chartres-style labyrinth at St. John's is constructed of flagstone and concrete. 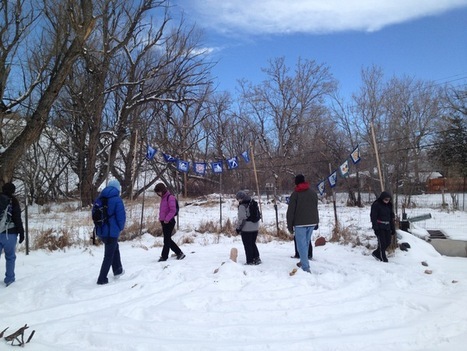 Walking the labyrinth behind the Unity Church of Boulder on a snowy day in February 2013. 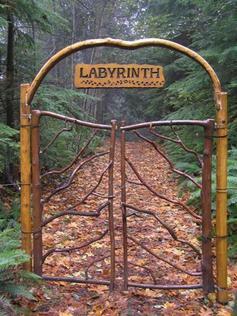 Others, like the rustic labyrinth tucked away behind the Unity Church or the earthy Cretan labyrinth in my yard, are more private or hidden. The Unity labyrinth has stones, shells and moss to mark the paths. It is dotted with little statues, and symbols painted on the stones. "It involves a calling to travel from one place to another, to reach a goal that for some reason appears to be sacred, special, in a profound way...They are the sacred places of the earth, the chakras and energy points of the planetary body. It is the earth, or the spirit embodied in the earth, the spirit of place, that calls us to it. The journey represents the path back to the Beloved, the Spirit - the path back to God..."
Over the course of 7 weeks, we will walk in a sacred spiral that follows a map based on the largely forgotten ancient Celtic chakra system of knowledge. 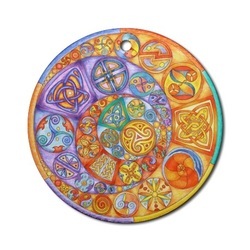 Using the same seven chakras of the traditional Eastern system, the Celtic system incorporates its fundamental principle of spiral movement to lead you through the chakras on a spiral path. 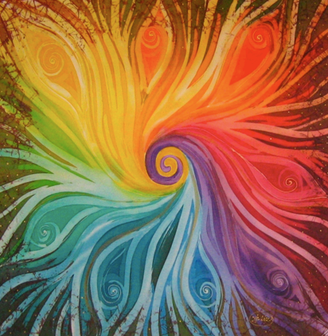 As Elen Sentiers says in her groundbreaking book, The Celtic Chakras, "the spiral contains both the cycles and the sense of progression but without the restricting points of either continuous outward expansion or continual return to the same place. It has a sense of breathing; a sense of continuity and newness...the and/or principle rather than the exclusive either/or that many folk live with." 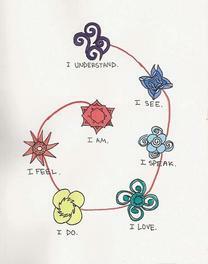 In Sacred Walks, Sacred Pilgrimage, each chakra is represented by a corresponding labyrinth. Just as each chakra is similar yet distinct from the other chakras, each labyrinth is also similar yet distinct from the other labyrinths. Even more, both the chakra and the labyrinth are a spiral in and of themselves, and are actually a perfect reflection of the other. Synchronistically, and perhaps even magically, each labyrinth is the perfect mirror and metaphor for its corresponding chakra. Each week, we will walk a leg of the spiral, culminating on the final day in a celebration, completion and incorporation of this sacred journey. where the rules are different and anything can happen." We will walk on mostly local bike and foot paths from labyrinth to labyrinth, often along the creeks of Boulder, in neighborhoods, through parks, as well as through the campus of the University of Colorado. Not only will you experience your home town in an intimate and personal way, my hope is that you will also see things that you've never noticed before, despite having driven or ridden by numerous times. 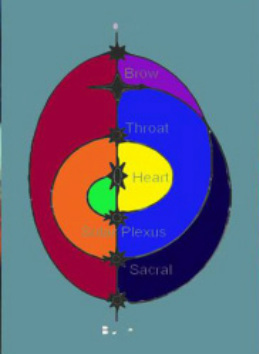 The length of the day's walk will be determined by the leg of the chakra spiral we are walking that day. We will walk as a group, but each day I will provide you with a map so that you can feel confident to find the destination if you become separated. The walks will vary anywhere from 1.7 miles to 6.5 miles, with the longer distances later in the fall, toward the end of October and into November, when the weather is cooler and you will have already been walking with this group for several weeks. By the way, no previous knowledge of chakras, labyrinths, or Celtic wisdom is required for this journey. Only your desire to walk, to experience yourself more deeply and to (re)connect with your heart's desires! Together, we will..."step outside of time, between the worlds, where the rules are different and anything can happen. In sacred space, we are receptive to the voices and presence of the Goddess in a way that we are not in our mundane surroundings. We have an expectation of experiencing that deep pleasure we call joy. Away from home, away from daily responsibilities.... opens up enormous space for the Divine to enter." Walk Your Path with confidence, clarity and compassion! WHEN: THESE HAVE CURRENTLY BEEN SUSPENDED DUE TO THE FLOODING IN BOULDER. Please go to my SACRED HEALING WALKS FOR COLORADO page for more information. WHERE: In and around the city of Boulder, meeting at and walking to seven labyrinths scattered around the city. Carpooling following our walks will be arranged prior to each walk. The location for each morning's walk will vary and depend on the leg of the spiral we will be walking. Also, please feel free to contact me if you need any additional information or have any questions that you need answered before signing up. I would be happy to talk with you. I so look forward to walking with you, to sharing the bountiful and beautiful gifts from the sacred path, and to accompany you on your journey home to yourself. 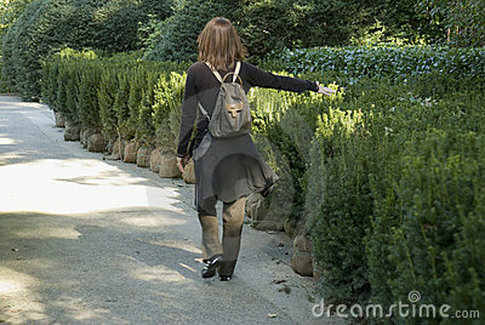 *it is solved through walking!